Back to casein! This ground was done by painting the casein over crumpled tissue paper–I waited until it was almost dry and then pulled it up. The effects are really nice and of course random. I did the ground way before I even thought to put this piece together. When I saw the photo and decided to draw the turtle I knew right away I would use this ground. I think I will do a couple of these…turtles are hard! I would like to get a little closer in I think. Also, I think that encaustic with some white encaustic over top would really add to the water feel, I will do a couple with that intention for the summer. 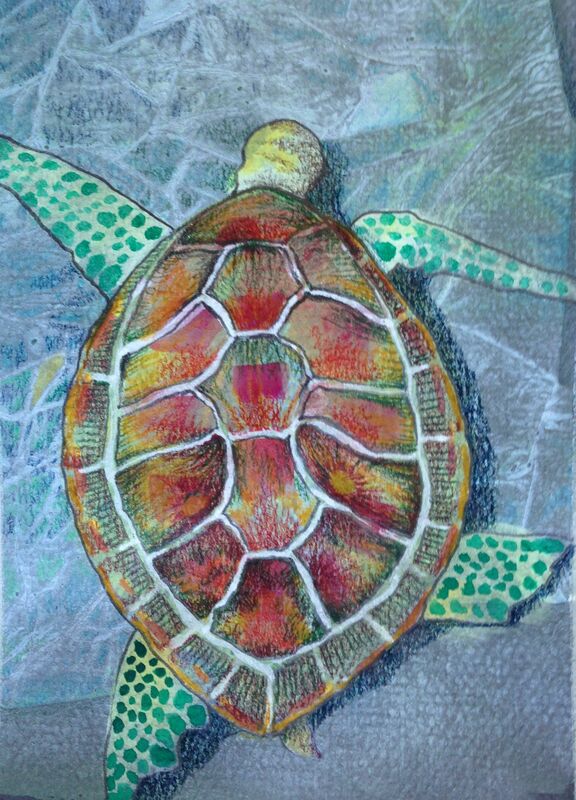 This entry was posted in Uncategorized and tagged casein, Hawaii, sea turtle, small painting. Bookmark the permalink.